Discussion in 'Cal 1400 8V' started by Guzzi_Lou, Jul 17, 2015. I got the valve cover off but need to know how to get the piston to TDC. Anyone help? Listen to this noise on the right side of the engine from the rocker .. hoping adjusting the valves will quite this down?? Btw, I'm going to assume that this noisy rocker is the one on the INTAKE side as the exhaust exits on the other side (it's quiet as you can see on the video) but can anyone pls confirm as the clearance on the intake side s/b 0.15mm while the exhaust side s/b 0.20mm? Sounds like you are not at the TDC, you should have play in both arms when so. Put a long slim dowel or long plastic straw in the upper spark plug hole (BTW remove a plug from both cylinders or you will be fighting compression)and rotate the motor in its normal operating direction with either the bolt crank at the front of the bike or put in gear, raise the back wheel off the ground and rotate rear wheel. You will see dowel/straw raise and lower, when at it furthest point up AND both rocker arms (both sets of intake and exhaust valves) have play in them you are at TDC. If you remove the flywheel rubber plug you can verify this with either a purple or orange mark very near the opening. Then adjust your valves, I keep to European specs of intake .15mm and exhaust .2mm, although I have heard that the American specs are different at .1mm intake and .15mm exhaust. Can anybody verify/disband this, are the valve specs different here in the USA because of ?ethanol? maybe or emission control regs ? That definitely sounds like far too much gap. Inlets have a smaller gap than the exhaust. Sounds like you could drive a truck through that inlet gap. Is it obvious that the adjustment setting looks different from the other inlets? There might be some other reason for the large gap. 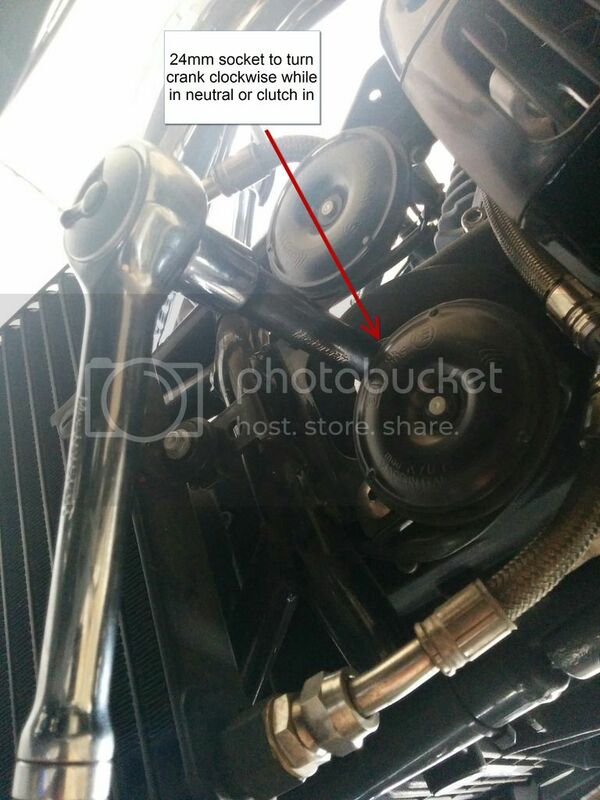 Can anyone confirm that the exhaust valves are on the side the exhaust exits on (ie. facing the front of the bike)? It would make perfect sense but yeah never know if the Italians do it different, lol. I have (on other bikes) removed a spark plug from each cylinder. I place a wood dowel in one of the plug holes and with the bike in gear, slowly roll it forward. Watching the dowel move up and down I can see where TDC is by seeing the highest point at which the dowel is raised out of the plug hole. Once I get that place, I mark the dowel with a Sharpie and remove it. When I do the other cylinder I just watch for when the mark is visible, which will be TDC. The only caution, is to be sure that the dowel moves up and down smoothly so it doesn't break off. NOTE: This can be easier if you elevate the rear wheel and have a helper slowly rotate as you hold the dowel (to keep it from snagging) and also more easily watch for the point where it reaches the highest elevation. Once the measurement is put a label on the dowel "Moto Guzzi Cali" so I can use it in the future and tell it apart from the TDC dowels I have for other bikes. John L and Guzzi_Lou like this. Valves are .006/.008, yes exhaust valves are on the exhaust side. Guzzi doesn't sell a lift, but there's a thread on it in this section. You can turn over the motor using the rubber plug hole access on the front of the engine. Thx Todd ... I tried rolling the bike in 6th gear and maybe my garage isn't long enough because for the life of me I couldn't slip a smaller feeler gauge anywhere - see below - is that where it's supposed to go? Use the bolt on the nose of the crank under the rubber plug on the front of the motor, and a 24mm socket. Be sure the piston as the top of the compression stoke, meaning just after the intake valve opens then closes. The gauge will go between the head of the adjuster and the strike cap on the valve. Much thanks to everyone and I finally did this ... easy once you know how, as they say. I'm going to add some more info and pics as they're worth a thousand words. 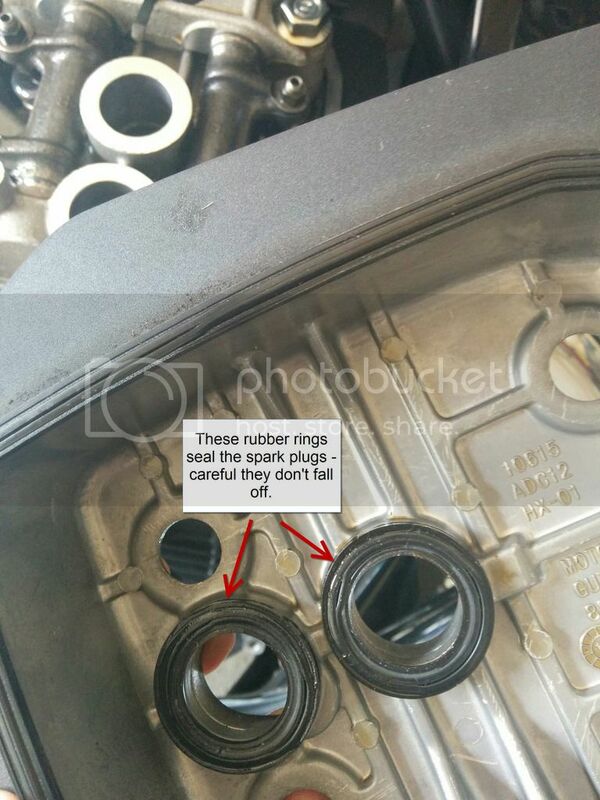 The spark plugs should be removed with a 14mm deep socket. Use the top hole to put your straw/dowel in to see when it rises to the top. That and when BOTH rockers have play in them (thanks Fast1400!!) when you move them as in my original video above shows and you s/b at TDC. Remove the rubber cap as shown below to access the crank bolt and with a 24mm socket (doesn't have to be a deep one), turn clockwise and watch the straw and valves move until the piston is at TDC. My issue was finding where the hell the feeler gauge goes. I finally said 'screw it' and loosened up the valve adjuster (pic below) until I could put the feeler in somewhere. The pic of the feeler in post #9 above is NOT where it goes - again see below for where you need to check. 1. 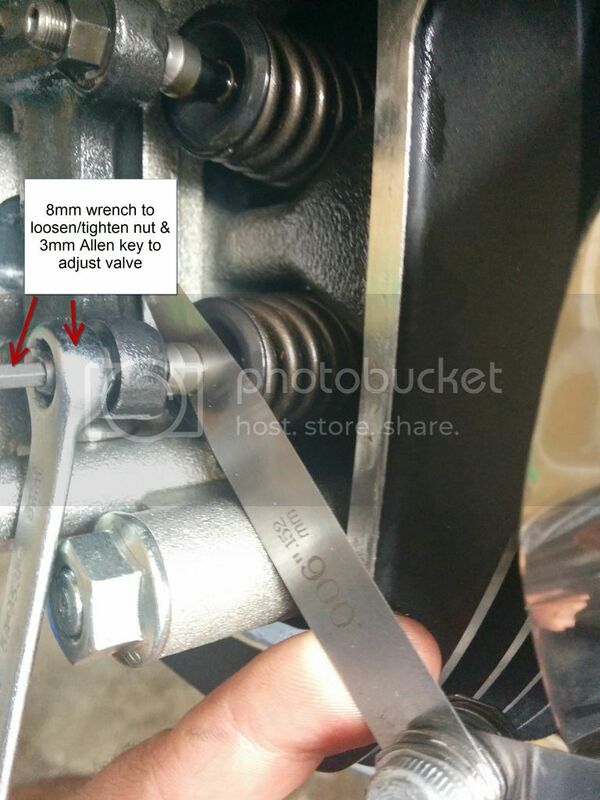 Before turning the crank bolt, remove both sides plugs so you're not fighting compression (ie. the air inside the cylinder can escape through the plug holes). 2. My plugs were all gapped too much so I closed the gap with an appropriate plug tool. Specs are .6 - .7mm. 3. 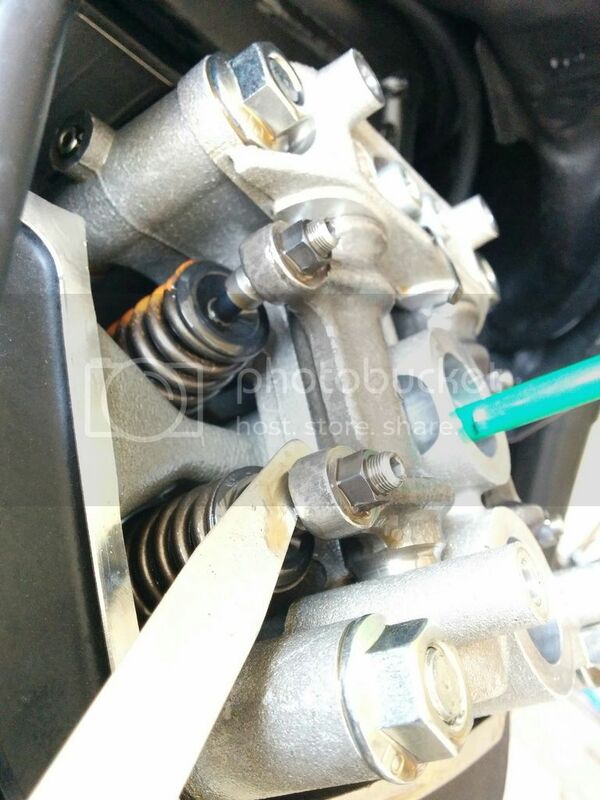 The intake valves (facing rear of bike) adjust to a spec of .15mm and the exhaust valves (facing front of bike where the exhaust pipe exits the engine) specs to .20mm. 4. Besides watching that those 2 plug rubber seals don't fall into the engine when replacing the valve cover, watch for the rubber O-rings on each of the 4 allen head bolts per cover ... they can come off easy and some will come off with the bolts while others will stay behind on the cover. I popped those that stayed behind off with a flat screwdriver and put them on the bolts for later re-installation. 5. This engine uses 2 spark plugs per cylinder and at first I marked "T" for top and "B" for bottom on the rubber boot cap but later noticed that 1 has an oval shape while the other is round so you can't mix them up when popping them back on ... key word here is "pop". Press the boot down firm and they will "pop" into place over the plug. HTH and let me know if anyone has any questions ... still have to ride it to see if this will quiet the valves down at all. You can easily make a lift out some pieces of 2x10 and a 4 foot length of 1/2" steel pipe. CRAFSTMAN (SEARS) also makes an "ATV Lift" that goes on sale from time to time for about $79.00. It also works nicely to get the California off the ground. ... still have to ride it to see if this will quiet the valves down at all. Sounds like you got it right! Best of luck on your test run after you get everything buttoned up. Keep an eye on those seals. I just did the third valve check on mine (12,000 miles). I looked at those bolt rubbers carefully and wiped them clean. I noticed they showed some wear but I figured if they weeped a little oil no big deal and I would order new. Was riding the bike to the dealer for a service indicator reset and noticed oil on my pant leg. Much more than a weep. I was over an hour from the dealer and he didn't have the seals in stock so I turned around and rode the half hour back home. I cleaned the oil off the bike and while I have 2 spare plug hole seals and a set of valve cover seals I did not have the bolt seals which appeared to be leaking the worst. So the bike is sitting waiting for a complete set of seals to arrive. I figured I had pinched a seal or similar but taking it apart I could not see an obvious screw up on my part. Good tip abbienormal but are you sure you didn't put 1 upside down? The ridge side of the rubber washer goes up to the underside of the bolt head (as I'm sure you know but might be worth a dbl-look-see). Just got back from an hour + ride and the ticking is still there but seems less noticeable at idle ... but I switched from 94 octane gas w/ ethanol to 91 without ethanol so not sure if that may be a factor. FWIW, I use the aforementioned Sears Craftsman MC/ATV lift with a piece of 1x strapping on the back lift pad, otherwise the front wheel will be a few feet off the ground before the rear wheel gets off the ground, its the way the C1400's frame is contoured that has to be compensated for. Guzzi_Lou, I noticed the same thing when I pulled my plugs for the first time, so I re-gapped them to service manual specs. Afterwards though, I noticed on hard (read full throttle) acceleration sometimes I would hear a little spark 'ping' reminiscent of older cars when either the timing was off (automatic timing advance not responding quick enough), bad gas, or wrong SP gap. With all other c1400 systems operating normally, I have to wonder why they are being delivered from Italy with wide gaps, IIRC they were about twice the factory specs. Can anybody verify this? Maybe someone who hasn't had their first or second service yet and is handy with tools care to pull a plug and measure the gap and post here? You know, I should've measured the gap before adjusting them closer but didn't think of it ... didn't seem twice the gap though ... maybe at .10? Didn't notice any pinging at all on mine this morning and it's hot out today. My bike only just passed 4.000 km though so it's pretty new. ... wonder if maybe 0.8mm may be a better option then for you? I'll be getting 1 of those lifts for sure when they go on sale ... thx for the tip on the plank at the back side F1400! Did you bolt the plank down to the lift pad btw? No I did't bolt the wood to the lift but it is entirely possible to do if the lift is only used for your c1400. The weight of the bike insures it won't be going anywhere, just be sure you place it correctly perpendicular to the frame rails as you jack it up. I also use the Sears lift for other MCs and 4 wheelers so my lift is not dedicated to just one vehicle. As for the plugs, I will have to order 4 for my next service interval, I have a feeling the NGK LMAR8F's are gapped wider from the SP manufacturer and where inserted by MG w/o checking the gap?